At the moment, the weather still seems to be on the Wintery side of things but it’s a lot less rainy here in Ireland than it was in previous weeks but saying that I still can’t kick my comforting soup lunches. I guess living in Ireland the Seasons never drastically change so you never need to stick strictly to certain types of dishes in different seasons. Which is great but can also be a little dull at times. I used to never enjoy soup, but I just began to realise in recent Months that it was a certain type of soups I didn’t enjoy. I like spicy, full of flavour and ones that you can throw loads of chickpeas into. This soup is a gentler soup and the type of soup I make when I want to get rid of some tired looking vegetables in my fridge. It’s mainly broccoli, but I have thrown brussels sprouts, courgettes and kale into it…basically anything green. 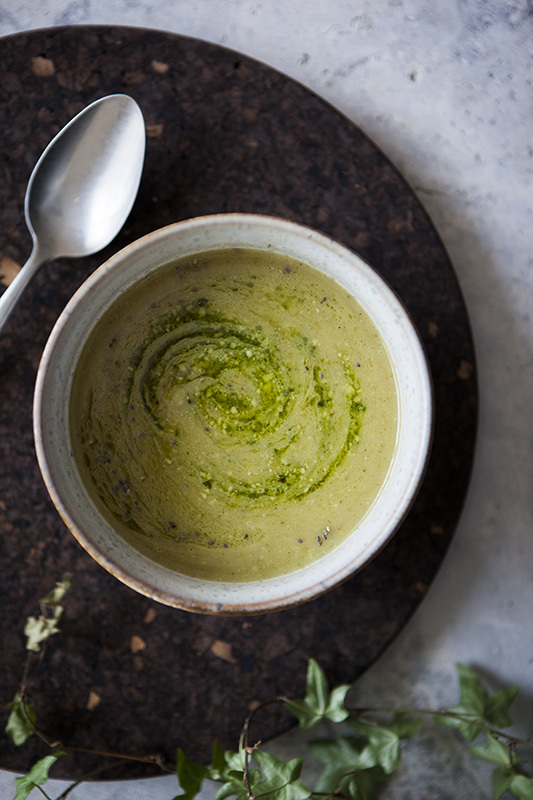 Pesto really brings this soup together, but I tend to throw pesto into most soups anyway and most dishes actually for that matter. If something is lacking I usually just plop a teaspoon of pesto in and I’m happy. Sorry non basil lovers, actually I’m not sorry at all. Start by having all of your broccoli, garlic, onion and potato chopped and having your kettle boiled for the stock. Place a large pot over a medium heat, add in the butter and when it begins to foam add in the onions and garlic. Fry for 2/3 mins or until the onions have softened, then place in your potato and broccoli (or any other veg you may want to add in). After another 2/3 mins add in your vegetable stock and bring to the boil. Let simmer on a low heat for about 10mins. Take the pot off the heat and with a stick blender (or whatever blender you use) blitz until smooth and there are no lumps. Add in your cheese, pesto and salt & pepper, give it a taste to see what you might need a bit more of and then when you are ready, place into bowls and serve with some crusty bread or crackers. I like to place an extra tsp of pesto on top of mine and also some chia seeds, but you can add whatever you like. Try adding some more cheddar or some garlic oil.